Italian architect and researcher Veronica Dal Buono, while writing about textured stone walls, stated “The effect they have on the senses imbues them with expressivity and the power of attraction“. Then another woman, another experienced professional in the design field, with her delicate sensitivity explained to us what these words mean to her. And we definitely felt like sharing her words with our readers. By Marzia Busa. I didn’t think, I didn’t know, I hadn’t touched it with my hand. I thought stone was cold. I was wrong. I thought it could only form slabs, with beautiful history and colours, but just slabs. I was wrong. I thought that there were other natural materials with greater potential for warmth and empathy. I was forced to change my mind. I drew towards natural stone for work. I met men, their passion, machines. I saw stones from all over the world, with incredible colours and incomparable nuances, and I saw, touched and experienced stone finishings which, when produced in 3D, take on incredible delicacy and lightness. 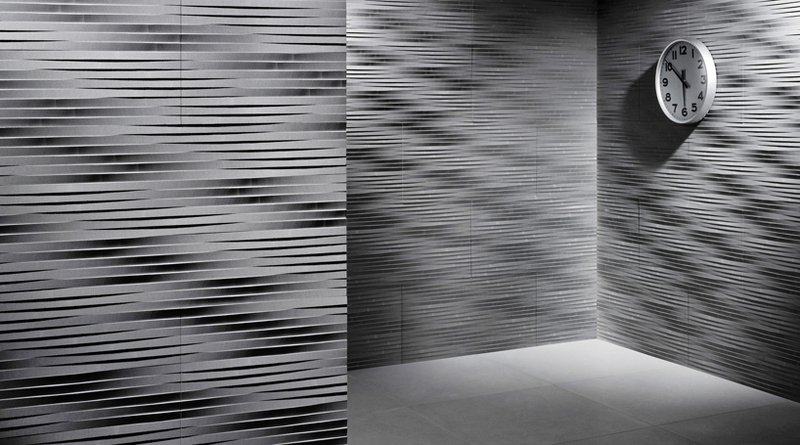 Waves, decorations, graphic signs and bands of light softly enter the material. On first glance, this gives a powerful yet soft aesthetic profile at the same time. Perceptual geometric shapes capture the senses in a surge of ideas, pushing the boundaries of what is possible and feasible. Stone is seductive. It is a living, pulsating material that is able to become light. 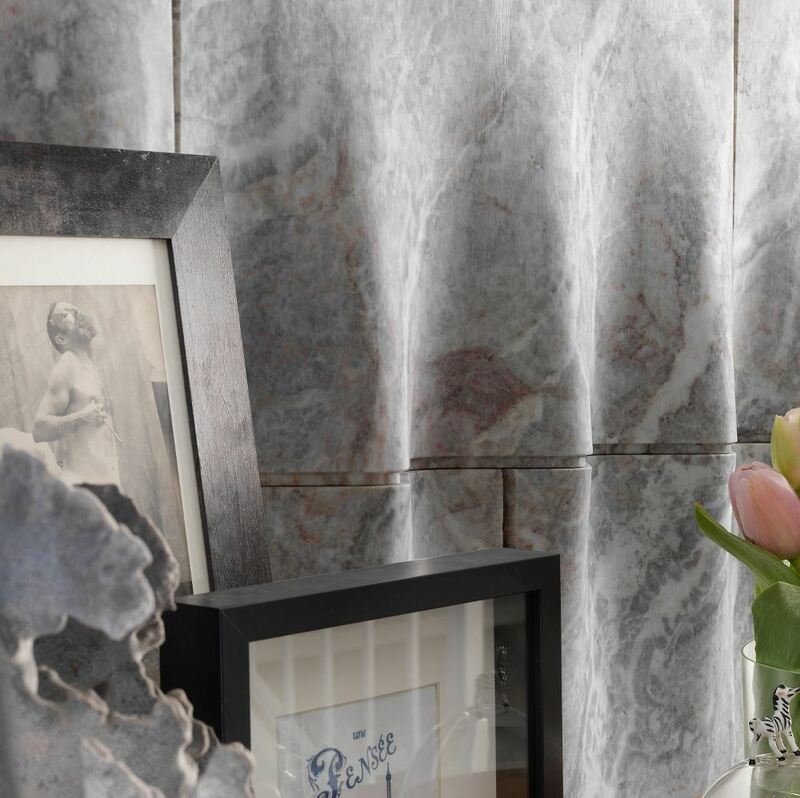 Lithos Design’s collection of coverings called ‘Drappi di Pietra, for example, have made stone soft and ethereal. Each model appears to be moved by the wind; just like a curtain. Chiffon, Organza, Tulle… each name evokes a weave, a sort of drapery that has been translated into stone and marble with enchanting results. Your hand instinctively wants to reach out and touch the wall with sensuous pleasure: the finishings feel like silk, or have the consistency of precious velvets, giving the wall an aura of soft sensuality. In addition to functionality and simple beauty, these coverings strike the senses, open up to lively design expressions, light and shade, multi-shape dimensions and aerodynamics. With Lithos Design’s stone coverings I have discovered a world of sensations, a “correspondence of amorous feelings” between contemporary design and ancestral material; a passionate discovery of the expressive possibilities of stone that seems to have a never ending vein of creativity. I know that bringing home a textured stone wall means bringing home a piece of the world’s history; a living and sensual element. A bit like a charm; an embrace for mind and soul, something that is instinctively pleasant to quickly brush with your fingers each time you pass by.